Looking for recommendations for a paint to use on a kitchen bench I am building. Right now thinking either Kem aqua, general finishes milk paint or proclassic. Color will be a bright white. Want a good durable finish that will stand up to use for a long time. I also intend on spraying with hvlp. Bench is made from maple (plywood and solid). Check out Breakthrough from PPG. Well is the top painted as well? or just the sides and top will be something else? Top will be painted as well. Interior will be prefinished ply. My preference would be milk paint, applied with a brush. It is almost indestructible. I’ve used General Finishes milk pain and it is easy to apply, but I’m not sure it’s true milk paint or just a look-alike. For a durable finish, get the dry powder and mix your own. I think you would probably have trouble spraying it because of the solids in the suspension. It makes a pretty coarse mixture and I strain it before applying its with a brush. It dries fast so you can apply a number of coats in a short period of time. The first couple of coats look pretty rough, but it evens out and covers well. I usually apply three or four coats. After the last coat of milk paint, I sand it smooth and put a finish coat of either BLO or wipe-on poly to seal it and give it a little sheen. BLO would probably give white milk paint an amber cast, so you might want to finish with a clear water borne finish. I have had good luck using the General Finishes products. 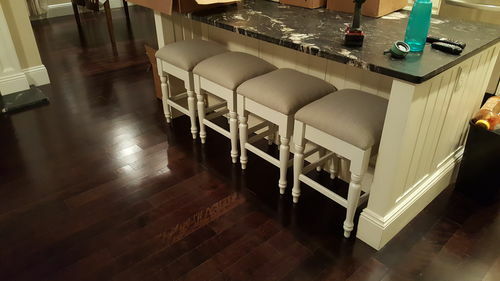 I used their milk paint, glaze and Polycrilic (I think they just call it High Performance topcoat now) on our kitchen island about 10 years ago and it has held up great and cleans nicely. Process was similar to MPython explained. I get good results using the foam brushes with their water based products. I sprayed their clear poly using the cheap purple HF HVLP sprayer on a dresser and was very pleased with the finish. 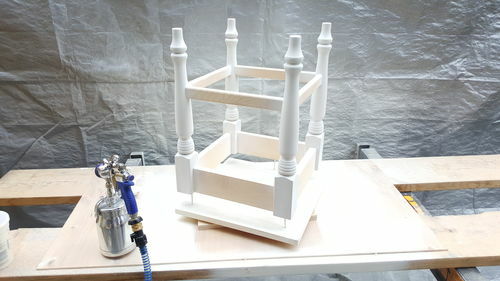 Hmm have only used wax over the milk paint, since that is what i read to use the first time i bought it. I agree the GF milk paint doesn’t feel like “real” milk paint. Maybe it has more additives? And yeah I don’t think i would personally try spraying milk paint. These were sprayed with bm advance. Its held up reasonably well through 3 years of daily use. I love painting with a brush. I like “Corona” brushes, an I love the old oil Impervo, sometimes can be found at Craigslist; “European Paints” are great too, but they can be a bit pricy.